We returned to Pornichet on Tuesday 24 June, only slightly delayed by the latest French Air Traffic Controllers strike. We had time to wait for our train in Nantes and discovered an excellent park close to the station. Back at the boat all was well in the sunny 25C.. Our first relatively short trip the next day was to L'Herbaudiere on the northern tip of Ile de Noirmoutier. This harbour is conveniently located for those making passages along the west coast but it is not the most comfortable. The alongside visitors pontoon is always busy so rafting is required. In addition the many fishing boats seem to delight in creating considerable wash thus ensuring a bumpy night. On our first evening we were hailed by Frank and Jennifer Singleton of Anhinga who are fellow Cruising Association (CA) members. But more than that Frank is a sailing weather guru who often presents at yachting meetings. See www.franksweather.co.uk. So naturally an invitation to pre-dinner drinks on Whileaway. Very enjoyable! But a late dinner! Bikes out the next day for a cycle to Noirmoutier the main town. And very interesting with some attractive traditional buildings it is too. Excellent cycle routes again, including through the salt marshes and later potato fields that the island is noted for. And the long sandy beaches by the camp sites. A surprise event on returning to Whileaway. A well equipped French steel cruising yacht had arrived and moored behind us whilst we were away. And on it talking to three middle aged people, were about half a dozen Douane (Customs Officers). Their cutter was moored a short distance away on the other side of the harbour. At one stage Andrea thought that she heard the sound of a power drill from the inside of the boat! After about an hour one of the trio (a woman) was taken away in the Douane rib to their cutter; it then returned and collected a man. They had not returned to their boat before we left the following morning. Intriguing! We would love to know more! On Friday we had a sunny 10 hours down wind sailing with a W3/4 to Les Sables d'Olonne. As previously a friendly welcome at Port Olona. Unfortunately the Saturday weather was most unfriendly and unusual; almost constant rain! 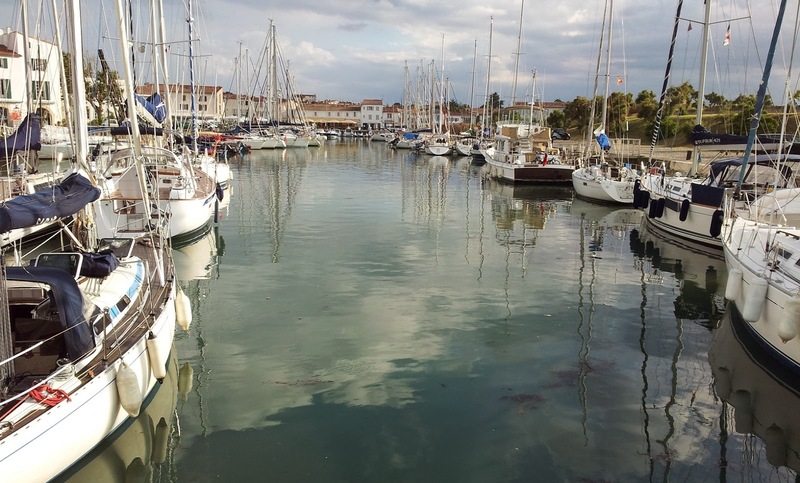 We went and viewed the Le Figaro Solitaire race boats due to go to Cherbourg on their fifth and final leg of a race that had included Plymouth in the harbours that they had called at. 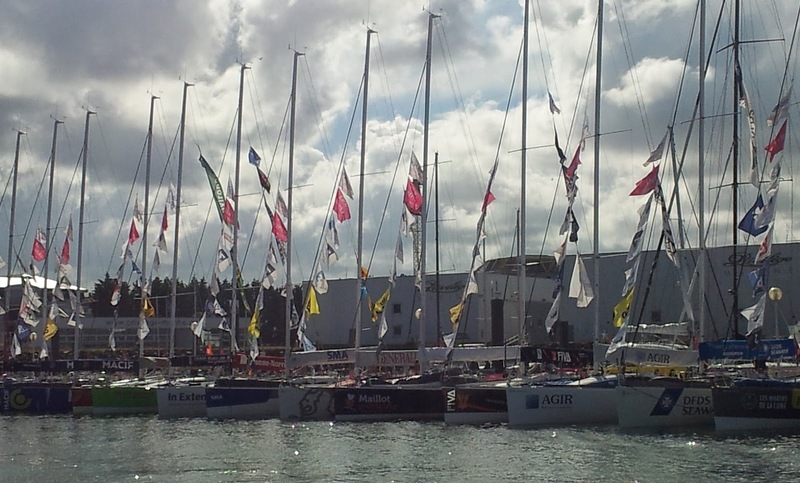 It is a prestigious single handed race and there were quite a few British contestants. Although we were like drowned rats we ventured on to the Poissonerie on the fish quay and selected our dinner! On Sunday we had another downwind sail, but this time with "beaucoup" swell on the starboard quarter making for a very rolly passage. Our destination was St-Martin-de-Re about 28nm S on Ile de Re. By the time we arrived the wind was a fresh W F5, we had some protection from the swell but now had a very short chop which combined with the wind and a very narrow gap between the wave breaker and the jetty made it a "challenging" entry! St Martin is described as the most attractive harbour in W France. Once through the entrance you can turn into a locked harbour that's right in the middle of a very attractive town with traditional building's all around. (Photo). Of course it is busy and there are many tourists but it is a lovely location. Another plus point on Ile de Re is excellent cycle paths and over two days we totalled over 40m on our Bromptons and were still (just) able to walk at the end of it! Other places we visited were also very pretty and there were also some lovely beaches with many camp sites.During our stay here France won through to the World Cup Quarter Finals so much cheering. After three days yesterday we sailed south again, under the bridge that for the last 30 years has now linked Ile de Re with the mainland, past La Rochelle and on to the relatively tiny Ile d'Aix where we picked up a mooring to have lunch and wait for sufficient tide to enable us to enter Boyardville on Ile d'Oleron. This is another of those timing issues where you need sufficient rise of tide to get you across the sand. So not so many attempt to visit but you then get a warmer welcome from the Harbour Master. In to another lock and as we did so a band on the quayside struck up to announce our arrival. Well maybe they were playing to others too ....Boyardville is a sharp contrast to Saint Martin being in the centre of a camping area and with very much a beach holiday feel. But an interesting area surrounded by water courses for many miles. Again we have cycled, this time around 20m and enjoyed some interesting small towns and villages as well as very different countryside. Tomorrow we make a short hop to the north of the island and to find a bar to watch France play Germany in the quarter finals!